For the past 49 days, I have been on a hunger strike. I have lived on the streets day and night, through sun and rain. 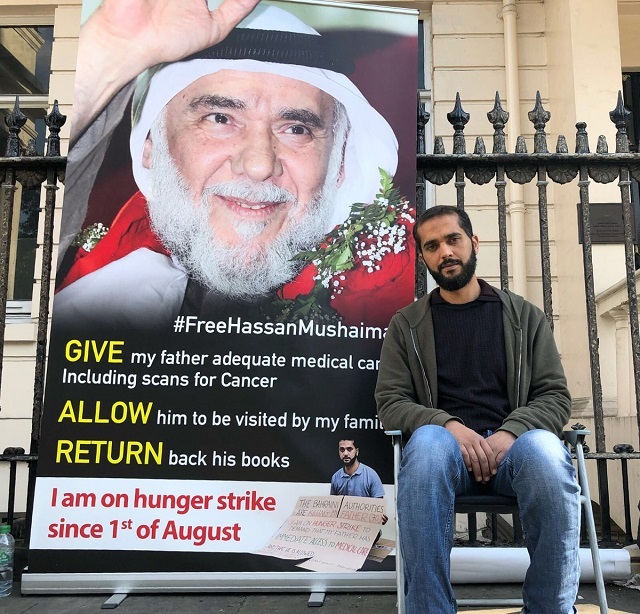 I am doing it to save my father, Hassan Mushaima who has been detained since 2011 in Jau Prison, where he has been tortured, abused and denied simple and basic human rights. In the years since, my father’s case has been raised by Amnesty International, Human Rights Watch and the Human Rights Council in Geneva. But none of this has made a difference to the Bahraini authorities. I started my protest because I felt I had exhausted all other options to help him. The Bahraini authorities are slowly killing my father, so I decided to do everything in my power to save his life and shed light on the suffering of all those who, like him, are paying the price for believing in democratic values. This has taken a physical toll. Since I began my hunger strike, I have lost 16 kilos, 20% of my weight. For the last 10 days, I have been joined by Zainab Al Khawaja, who came all the way from Denmark to express her solidarity, and launched her own hunger strike. Zainab is a well-known activist and her empathy for the human suffering of others, and strong human rights ideals have cost her being arrested about 12 times in Bahrain. On one of those occasions she was pregnant. On another she was detained with her infant son. Her father, leading human rights defender Abdulhadi Al Khawaja, suffers from the same fate as my own father. Both men have been tried in the same case and are now facing life imprisonment. My hunger strike and sit-in have helped raise awareness of the brutality of the Bahraini government. They have also led to some concessions, with my father having been given access to cancer screening and to some of his medication – both of which had been denied previously. 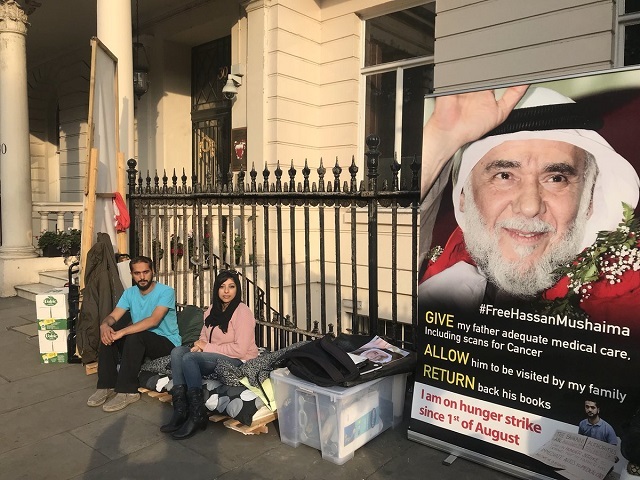 By taking this action, I have allowed my father’s story to be heard, and helped to expose the terrible suffering of political prisoners in Bahrain. My action has also shown the extreme lengths the Bahraini authorities will go to silence political dissent. My demands are so basic and simple that it would have taken them a few hours to address them. They could have stopped my protest at any time if they wanted to. But instead they have refused to even give my father the most basic rights. These are rights that every prisoner should have. Despite being a London resident, the British government has done little to help me. Instead, it has made its position clear by supporting the false statements and lies of the Bahraini government. It has sold millions of pounds worth of arms to Bahrain, and spent millions of pounds of taxpayers’ money to train its violent police force, and to teach them how to whitewash their crimes. Several British MPs have taken up my cause, with Caroline Lucas, Ian Blackford, Jim Shannon, Tom Brake, Andy Slaughter and Chris Law all showing me extraordinary support, despite coming from different parties. However, despite their strong interventions, their voices have been ignored. I have written to the Foreign Secretary, Jeremy Hunt, but he has not even replied. I even wrote to the Queen, who counts the Al -Khalifa family among her friends, but she has refused to help me. Theresa May and her cabinet claim they are supporting democratic institutions, but in reality they are providing a fig-leaf of legitimacy to regimes that implement repression and carry out abuses every day. After 44 days, doctors, as well as human rights activists and many friends urged me to end my hunger strike, including a message from Nabeel Rajab, a Bahraini activist who is himself detained in Jau Prison. But what affected me the most was a call from my father. He told me how scared he was the day I was hospitalised. I will not end my hunger strike, but I have moved to a liquid diet which will include soups. My body needs to recover, but if my father’s basic rights are not met I am ready to resume it. My father is a prisoner of conscience, and should not be where he is. Not only will I fight for his freedom, but I will also fight for his right to life and dignity as a human being. This is not easy, in fact it could be life threatening, but I will never stop fighting for my father and for our cause. You can sign and share this petition in support of Ali’s demands.